We were hosting family for a Christmas Eve dinner, and we needed to make some dishes that would taste good without having meat and garlic/onions as ingredients. This dish fit the bill and let the natural sweetness of the winter vegetables provide the flavor. Serve over cous-cous (w/ almond slivers) or other similar grain. Preheat oven to about 400 degrees. Cut raw squashes in half, length-wise, scoop out fiber/seeds. Put squash halves, flesh-side up, on baking pans, and drizzle a little olive oil and salt on top. Cook squashes for about 30-40 minutes, until soft and you can cut the vegetables into smaller squares/chunks. Then, put the vegetables back in to roast, on a slightly lower heat (~350 degrees) for another 30 minutes or so. This entry was posted in Main Dish, Vegetarian. Bookmark the permalink. 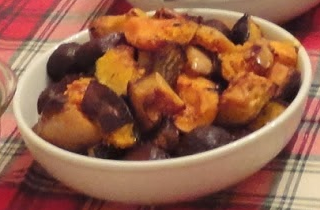 Nothing better than roasted root veggies and squash in the winter months!